FINALLY! Cryptocurrencies have woken up from their slumber and are on the move. Is it too early to set my sights on these upside targets? 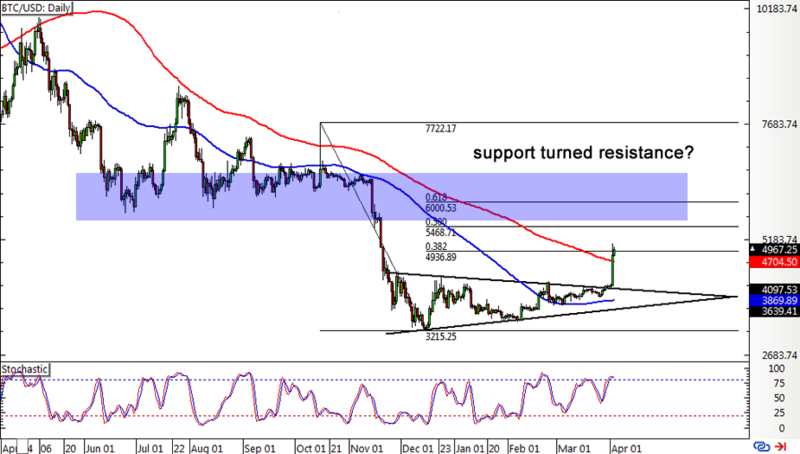 Bitcoin made convincing upside break from its symmetrical triangle formation, confirming that a rally is in the works. This chart pattern spans around $1,200 in height so the resulting climb could be of at least the same size. Price is now testing the $5,000 major psychological mark that lines up with the 38.2% Fib seen on the daily time frame. At the same time, stochastic is nearing the overbought zone to reflect exhaustion among buyers and signal a possible return in selling pressure. If bulls keep charging, though, they could still aim for the next targets like the area of interest around the 61.8% Fib. This coincides with another major psychological handle at $6,000. The moving averages are still suggesting a continuation of the slide, but there is bullish hope from bitcoin busting above the 200 SMA dynamic inflection point. Ethereum also made an upside break from its symmetrical triangle consolidation pattern to show that bulls have won the upper hand. This chart pattern spans $84 to around $175, so the resulting uptrend could be of the same height. The 100 SMA is above the longer-term 200 SMA to signal that the path of least resistance is to the upside or that the climb could keep gaining traction from here. However, stochastic is already dipping into the overbought zone to indicate potential bullish exhaustion and a possible takeover by sellers. 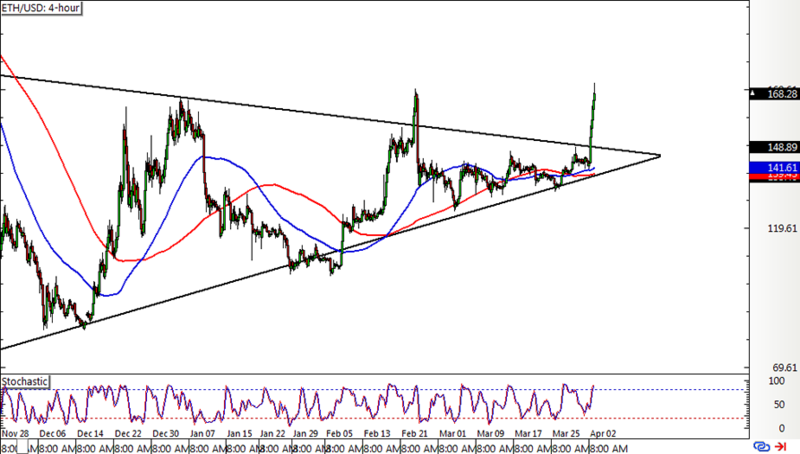 Litecoin has already been on a tear in the past few weeks but could still be poised for more gains as the moving averages are gearing up for a bullish crossover. Also, stochastic previously made its way down from the overbought zone but changed its mind to turn back up again! If this keeps up, litecoin could move past the 38.2% Fib that’s currently holding as resistance. The next area of interest appears to be spanned by the 50% and 61.8% Fib levels around $100-120, which was a previous support zone. 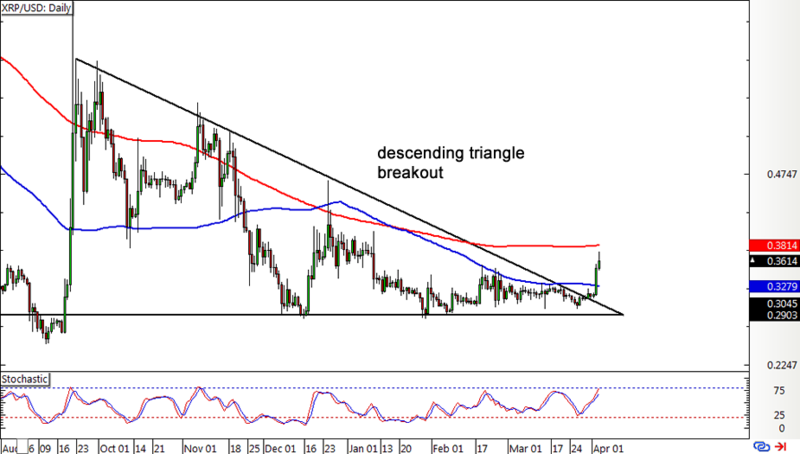 XRP finally broke out of the long-term descending triangle pattern that had been holding since late last year. This suggests that a big uptrend may be in order, possibly lasting by the same size as the triangle or until the pattern’s highs at .6165. The 100 SMA is below the 200 SMA for now, but XRP has closed above the faster moving average to signal a bit of bullish pressure. 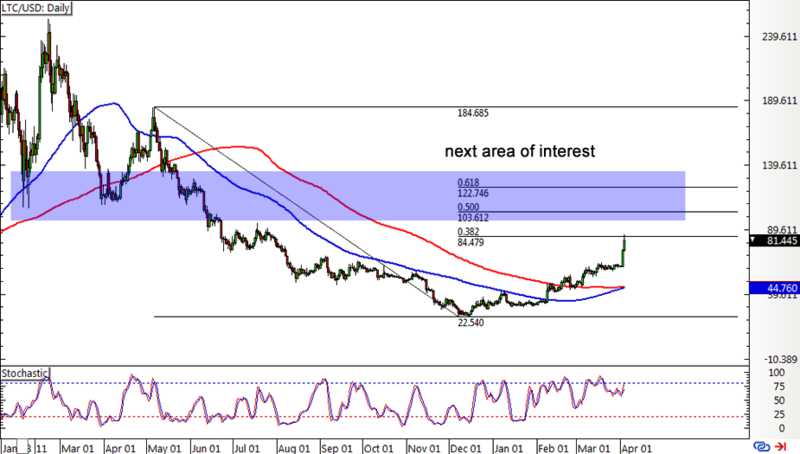 A move above the 200 SMA dynamic resistance could encourage more bulls to join in. Stochastic has room to climb before reaching the overbought zone, which suggests that buyers could stay in the game for a bit longer before needing to take a break.